I have a confession to make…an ugly, embarrassing confession. It’s about my bedroom. The Bad News is that I didn’t take any pics (I thought I did, but can’t seem to find them on my computer)!! Either way, I knew her dresser was only a temporary solution and was waiting to blog about it until I had a solution for this space. Since the temporary solution was working just fine, we weren’t in a rush to replace the dresser so we waited until Casey needed the dresser back before moving forward with an actual plan. 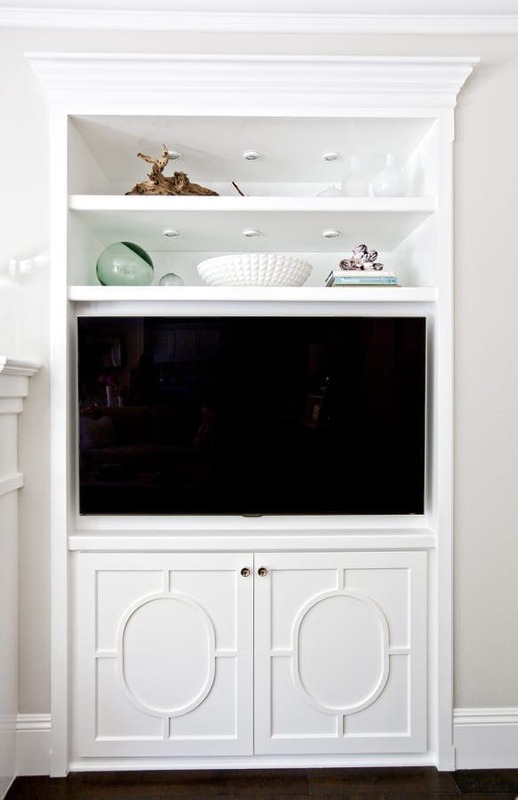 Fast forward a few years and as you know, Casey moved into her first place and needed the dresser back in order to hold her TV in the family room until her built-ins were installed. 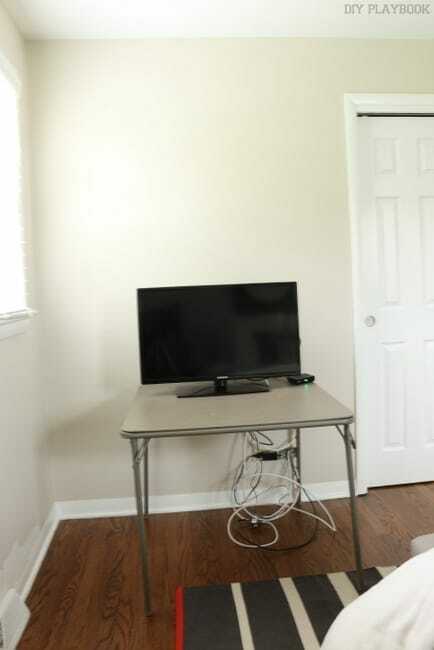 On moving day, Matt and I drove her dresser back to the city and brought the only thing we had on hand into our room to hold our beloved TV– this card table. 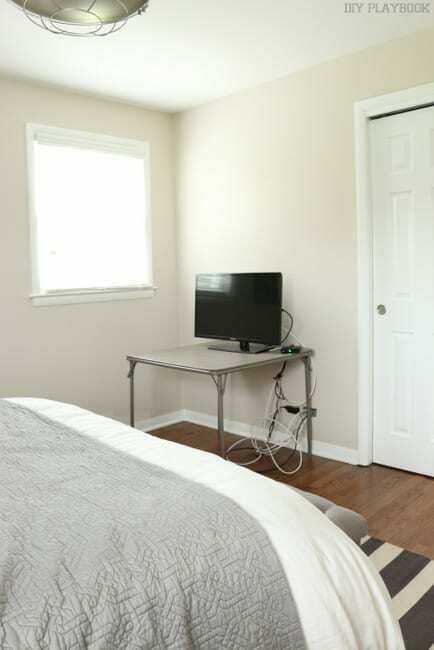 (And yes, we do love having a TV in the room. We watch the news every night during the week and drink coffee in bed while watching the TODAY show together on the weekends. I know some people say it’s a bad idea to have a TV in the bedroom, but we really do enjoy it). After lots and lots and LOTSSS of brainstorming and pinning, I came to the realization that 1. a card table in the bedroom is NEVER a good idea and 2. as much as I’m being a bad blogger by not stepping “outside the box”, I just keep coming back to photos of built-ins and loving everything about them. I feel bad that this will be our 4th built-in project on the DIY Playbook, but then I realized that I really do love the classic, clean, heavy-on-the-storage reality of the built-in unit. And let’s be honest, not choosing to do it in our bedroom just because we’ve done it before on the blog doesn’t seem like a good enough reason to pass on it. Why not stick to what we really do love in our house, right?! So… it looks like a built-in it is. I thought about tackling this project with my dad, but he is over-committed with work right now and to be perfectly honest, I cannot tackle this project by myself… especially working full-time. Heck it would be January 2017 before I got this baby done. Plus, I can’t live with this card table any longer!! 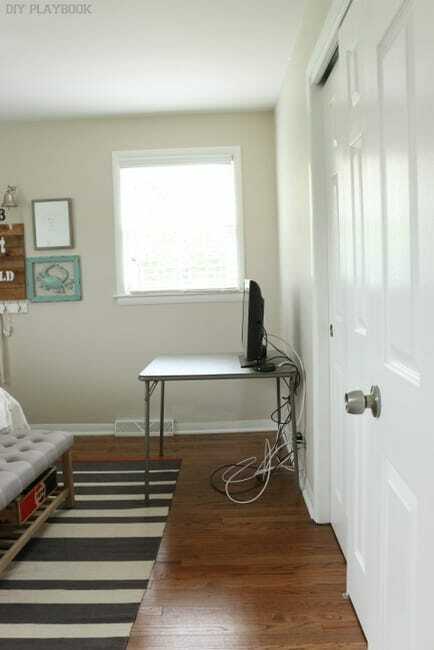 I mean it’s pretty embarrassing when we have people over and a DIY/home decor blogger has a card table in her bedroom. A-W-K-W-A-R-D. So, I hired out this project (bad blogger… again!) and have the mini built-ins ready to be installed sometime next week. My carpenter told me it should only take about a day to get them in (say whattt?!!! way better than Jan. 2017). He’s only installing the wood so when he’s done, we’ll still have to do is paint them, which is far more doable on my to-do list right now. I’ll keep you updated on the progress, but in the meantime, if you take anything away from this post I hope it’s this: A card table in your bedroom is NEVER a good idea. Period.